Spokane starter Renay Bryand pitched into the eighth inning of this July 1988 game, giving up just one run and one walk, striking out five, according to The Spokane Spokesman-Review. Spokane manager Steve Lubratich focused on Bryand's single walk, noting to The Spokesman-Review the previous night's pitchers walked the lead-off hitter five times. "That's the difference. Renay hides the ball well, gets it over for strikes and fields his position," Lubratich told The Spokesman-Review. "He knows the game." Bryand went on to take his difference to play in seven professional seasons. He made it up to AAA, but he never made the majors. Bryand's career began that year, taken by the Padres in the 25th round of the draft out of the University of California-Santa Barbara. Bryand started with the Padres at short-season Spokane. He went 6-3 over 18 games, six starts. He ended with a 2.48 ERA. In his second outing of the year, Bryand went six scoreless innings. He didn't give up an earned run over those two games. In early September, Bryand went into the eighth inning, giving up one run. 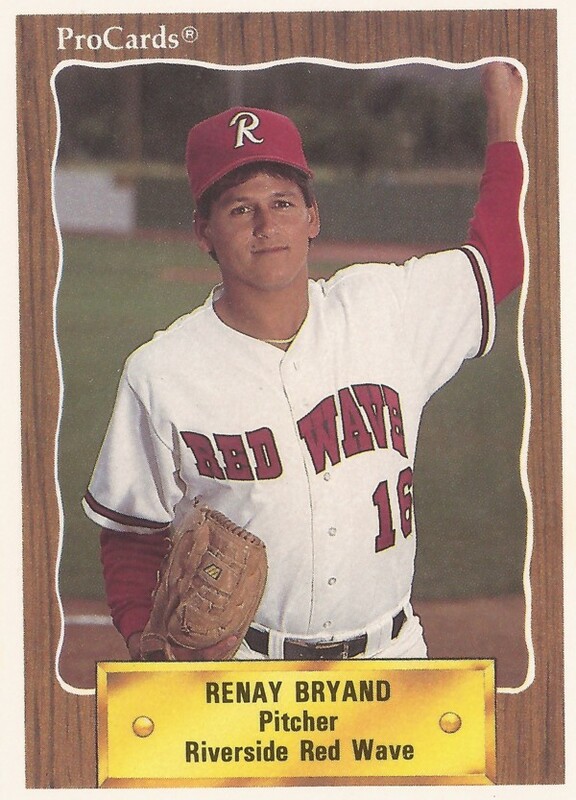 Bryand moved to single-A Charleston for 1989. He went 8-5 over 48 total outings, one start. He picked up a loss in a May relief outing against Sumter, giving up a solo home run. Bryand made high-A Riverside in 1990, then played most of 1991 at AA Wichita. In 49 outings at Wichita, Bryand had a 3.09 ERA. Bryand went on to play parts of four seasons at Wichita, his last in 1994. Along the way, he also saw AAA Las Vegas twice, once in 1992 and once in 1994. Playing for Wichita in 1993, Bryand got major leaguer Oddibe McDowell to fly out, helping Wichita to a win. In 1994, he split 24 outings between Wichita and Las Vegas, posting a 6.75 ERA, ending his career.